This is the best scarecrow I've seen in a long time, "Gone Rogue Island- Miss Sarah Palin." It was entered in the Wickford (R.I.) scarecrow contest this year and like last year's presidential elections, took second place. Ms. Gone Rogue Island is the creation of Ms. Melissa Devine, a friend of my boss. 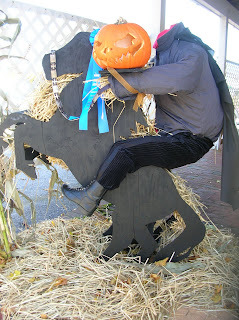 The Headless Horseman, also pictured, took first place and I don't know who's responsible for him. And since it's Halloween, thought I'd pimp out some of my spooky travel related experiences, such as the evening I spent in a Tallahassee cemetery with paranormal investigators, or a list of my favorite Voodoo haunts in New Orleans. Since I'm one always up for a good ghost tour, here's a review of last year's Savannah midnight ghost tour and finally, a list of ghost hunting hot spots in Northeast Florida. And speaking of ghost tours, I joined Historic Ghost Tours of Punta Gorda (Florida) this evening for a cemetery walk, stay tuned to SoloTravelGirl.com for a summary of that experience. 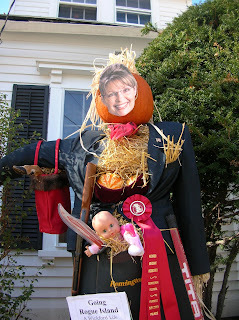 Yeah, a Sarah Palin scarecrow would definitely frighten me (I'd be afraid that it'd be real). LOL! I loved it because the creator really put some thought into the detail.